These license plate tags are laser cut "Mirrored" License Plates and come in a large selection of colors and styles. 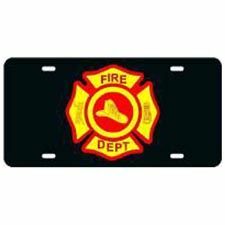 These auto license plates are constructed of shatterproof mirrored acrylic with an inlaid acrylic logo that is related to the firefighting and EMT fields. The artwork on these car tags are cut out by lasers and assembled by hand. This Fire Department license plate is black with a maltese cross and scramble.